This interview was conducted in late 2008, and first published by the now defunct The Silent Ballet on February 7, 2009. Since then I’ve gone on to interview many Italian artists, curate 2 compilations of contemporary Italian music, and inaugurate a research project exploring the links between Mail Art and Cassette Culture. It also introduced me to Matteo Uggeri, who I count as a friend and who has since introduced me to a great many other artists, and without whom I would never have been able to complete Con Fuoco. So, in a way, this interview started it all for me. Since TSB is now defunct, I am republishing this here for posterity. Joseph Sannicandro catches up with Italian instrumentalists Sparkle in Grey, the recipients of an Honorable Mention in TSB’s Top 50 Records of 2008. 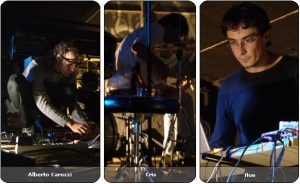 Sparkle in Grey are a four piece group based in Milan, Italy, making melodic but noisy music that utilizes electronics, found-sound, and field recordings, as well as the more traditional violin, bass, and guitar. Originally a side project of Matteo Uggeri [Hue, Der Einzige], Sparkle in Grey’s recent four-piece debut LP A Quiet Place was well received. I spoke with Matteo and Alberto, (and limited input from Cris and Franz) practicing my Italian and learning about the state of experimental music in Italy today. So, who are you guys? Where do you come from? Matteo: The group is made up of Alberto Carozzi, Cristiano Lupo, Franz Krostopovic and me, Matteo Uggeri [Hue]. We live in the Milan area, in the north part of Italy, one of the most industrialized areas in the whole Europe, and one of the ones where the worst people live (a lot of evil narrow minded folks). Matteo: Me and Cristiano started playing together in an experimental/fool new wave band called Norm more or less in 1999, and Alberto was a good football friend of ours, and also a fan of most of the Norm records (that are still unreleased so far). He was playing bass in a post-rock band called Yakudoshi and asked me to record something together, as he was interested in the weird electronic music we were making. Alberto organized a live gig in Monza (in a place not far from the famous Formula 1 circuit) in September 2005, and it was the first show of us as Sparkle in Grey. Franz joined later on, in 2006; he was playing the violin in Pulp-Ito, a group closer to the rock sound of CCCP/CSI, and they needed a bass player. He asked Alberto, but at the end he never joined Pulp-Ito and Franz got into Sparkle in Grey! Did Sparkle in Grey always play the same style of music you currently play? Matteo: No, at the very beginning Sparkle in Grey was a sort of solo-electronic project that was born in 1999. I always tended to have several side projects (Der Einzige, Hue and so on…) and SiG was one of them. AFE, a small Italian label, issued the first album, “The Echoes of Thiiings” in 2003, which contained 12 tracks in a Morr Music / Warp electronic style (more or less). 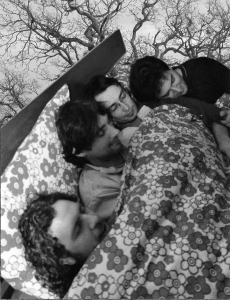 The music changed a lot with the other musicians and their instruments, moving to post-rock style + electronic… But also us four try to move from one genre to another, for instance mixing our sounds with other collaborators like Maurizio Bianchi/MB or pop artist like Kiddicar. What inspired you to play instrumental music? Was it a conscious choice, or out of necessity? Matteo: I can speak only for myself, but I strongly prefer to make instrumental music. One of the reasons is that in my opinion if you sing you should sing very well and say clever things… otherwise the result may be very pathetic. I also love sung music, and also singers that are maybe not really good (for instance I’ve been for a long time a huge fan of all the Current 93/Sol Invictus/Death in June congregation), but probably I’m too insecure to sing or write some lyrics. For our next record, anyway, we sometimes talk about asking some singer we love to make a cameo on one or two songs… I would really like to ask Angèle David-Guillou of Klima/Piano Magic, but she doesn’t know it yet! Alberto: In the very first band I played in, there was a lady as a singer, she had a great voice, I loved her…but during that time, day by day I realized that everything I was doing was made to support her. This could be a good way to make music, but I don’t need it. If you do this way, you don’t look at thousands of other possibilities provided by music. I’m more interested in music than in supporting singers. Where does the name “Sparkle in Grey” come from? Matteo: You’re the first one who has asked me this! It’s a bit silly maybe but… it comes from the idea that most of the things of this ugly big world are not exactly bad, tragic or awful, not really “black” but maybe “grey”, in the sense that most of our days don’t reserve for us beautiful things, they are flat, spent in boring jobs and so on. But sometimes there’s something nice that happens, some tiny light, some love, some sparkle. And so would be our music, quite melancholic and sometimes heavy but with some shining hope in it. What do you hope to accomplish with your music? Unlike music with lyrics, that maybe relates a story or narrative, or dance music, that serves social function (making people dance…), instrumental music can be more ambiguous, less clearly defined in its utility. What, if anything, are SiG expressing, and how do you hope to interact with your listeners? But, pun aside, I dunno what is the way the listeners can interact with our music, but where’s a beat you can dance or move your body back and front… and we like having many sound layers on the same track, so if you pay attention you can enjoy it more. Cris: Most of the songs are born in a very spontaneous way. We go into the rehearsal room and we start improvising on Matteo’s laptop beats and then we refine the songs until they are ready to be performed live. Like many other people we express our personal frustrations through music I think. Alberto: Maybe the answer is inside the music, we interact with listeners through music, hoping they like it, and we’re strongly interested in what they find into it, if they find something. For example some reviewer and also some simple listeners or fan revealed to us that our music is good as a soundtrack for cooking or washing dishes. Strange, but cool! Do you incorporate any other media? Many instrumental bands these days seem to work with artists, projectionists, or film makers. Matteo: Not yet. We are pretty interested in this, and a friend of ours is doing a video for The Last Cloud from “Nefelodhis,” and Cris drew a storyboard for Goose Game that should be made with marionettes, but we don’t yet have the resources to realize it. Anyway, I don’t really like to have ‘visuals’ while we play… In general I think that too many artists today are using ugly videos during their performances. I prefer that the audience looks at our own ugliness! Alberto: This could be a good experiment, if we have a good idea, we should try. I’d like to make music on images, sounds give invisible colors to images, they can give direction to emotions and reactions, I definitely want to play with these kind of things. Is the band full time? What do you do when not playing? Does the band perform live frequently? Does Italy have government subsidies for the arts? Matteo: Unfortunately the answer is negative in all cases. We do normal money jobs to survive: I work for a university as a P.R. ; Franz is in the advertising placement field; and Al and Cris are both warehousemen – but we are so young and beautiful that we would like to become models! By the way, we don’t have the opportunity to play live often, because the situation in Italy for art is terrible, especially for music. Our awful government is stealing a lot of money and cutting founding for health, research, education and arts, so many small venues are forced to close or to let play only famous bands that allow them to earn enough to survive. Moreover, the musical culture in our country is not very good, as most of the people have very narrow tastes in music. In other EU countries like France or especially in the Netherlands or Sweden it is much better. In the next life we’ll be tall beautiful blonde Swedish model musicians. How did you come to work with Giuseppe Ielasi? Can you describe the experience? Is Ielasi well known in Italy? Matteo: I’m sure that Ielasi is better known abroad than in Italy, for the above reasons, and for what I know he lives now in France. It was great to work with him, as he’s a very good guy and helped us a lot during the recording sessions in his studio, with a good balance between being professional and friendly. I knew him for quite a lot of time and not for musical reasons, and I was pretty surprised when he accepted to record and mix A Quiet Place. We did it in a quite short range of time but very carefully, and then we made the final mix together to find the better balance among the variety of acoustic and electronic sounds, a thing in which he has a very good experience. Thoughts on the contemporary music scene in Italy? Any bands you are excited about? Any particular city have an exciting music/art scene? Matteo: It seems to me that there is no a particular city or region at this time in Italy with an exciting music scene, but there are very good artists all around the territory (even if most of those who decided to make money with music have moved abroad)… I have a big esteem for Sigillum S, Tasaday, Officine Schwarz and Maurizio Bianchi, that are pioneers of experimental and industrial in Italy since the eighties, but I also like more pop bands like Massimo Volume and La Crus, or big old glories like Paolo Conte or [Ennio] Morricone… Among today’s ’emerging’ artists I may mention Populous, Andrea Marutti, Punck, Logoplasm, Harshcore, Fhievel, the guys of the Palustre label, Comaneci, Fabio Orsi, Andrea Ferraris, 3/4HadBeenEliminated, Alessandro Calbucci, St.Ride, OvO and many others… But I cannot be objective, as many of them are friends or even collaborators! Alberto: Despite the situation above mentioned by Matteo, despite the fact that selling records is almost impossible, everybody plays, everybody make records. New tendencies, in my opinion, are too influenced by English or American music, maybe me too, but I don’t want to reflect these influences as a silly monkey. We should give more attention to our culture and tradition, giving them our point of view in the composition process, that does not have to be absolutely submitted to conservative rules. Though DJs and pop music are very popular today, Italy has a rich tradition of avant-garde music. Are you influenced at all by folks like Luigi Russolo (the Futurist and pioneer of machine music), Le Stelle di Mario Schifano (Italy’s avant-garde answer to the Velvet Underground and Warhol) and Luciano Cilio (a sadly little known Italian genius who took his own life, leaving us the stunning beauty of Dell’Universo Assente)? Do you see current artists such as yourself coming out of this sort of tradition, perhaps unique to Italy, which fuses classical concepts and styles with experimentation and rock, and such, or do you identify more with global music (i.e. media coming out the States, UK, etc) or World music, or what? Matteo: Personally I’m not really into this tradition, even if I greatly respect these musicians and especially like the “intonarumori” (noise machine) concept of Russolo. Believe it or not, also the fame of these artists is wider abroad that in Italy, where most of us (including me) are influenced a lot by American and UK music. I grew up listening the ’80 bands of the post-punk scene, from The Cure to Cindy Talk or industrial artists like S.P.K. and Controlled Bleeding… So my culture is ‘lower’ than you maybe expected! Alberto: I suspect I anticipated your question! With so many stellar releases coming from Italy in the last few years (Neil on Impression, Giuseppe Ielasi, Emanuele Errante, Il Rumore Del Fiore Di Carta, Port-Royal, Giardini di Miro, Rosalina Mar, and so on) one would think their exists a community within Italy that appreciates these artists. Hopefully such a community is being forged now. Well, to shift gears, what are your alcoholic beverages of choice? Matteo: Wine for me! I love strong red wines from the south, like Manduria, or tasty white wines like Verdicchio… And my favorite wine ever is a sort of Lambrusco that my uncle made in Emilia Romagna! Anything you’d like our readers to know about Sparkle in Grey? Alberto: Berlusconi is not speaking in our name, whatever he says. We are planning an escape to Mexico, can anyone help us? Well the grass is always greener, huh? Mille Grazie! The Silent Ballet would like to thank Sparkle in Grey for the interview. A Quiet Place is out now through Disaster by Choice.